I first had this salsa about ten years ago, on one of the hottest days of the summer in Atlanta. I was visiting my friend John Ryan, who had recently become acquainted with it when a co-worker brought it to a potluck. I'll admit, I was skeptical: dried pineapple in salsa? At the time, it sounded more like a science experiment than a culinary revelation. In fact, it proved to be very much the latter. It's not just the dried pineapple (and please trust me that you must use the sweetened kind) that makes this salsa such a success, but how it plays off the smoky heat of the chipotles and the pert astringency of the tomatillos. This salsa is a symphony, not a waltz. The original recipe, from this article in the New York Times by Molly O'Neill, calls for the onion and tomatillos to be raw, and it's really pretty aggressive with the chipotles. I decided to up the smokiness by grilling the tomatillos and the onion briefly, and to cut back on the heat by reducing the amount of chipotles in adobo (I did add a pinch of red pepper flakes for brightness). The original is fantastic, but I like this version too -- it's a little more mellow but still packs a hot-sweet punch. 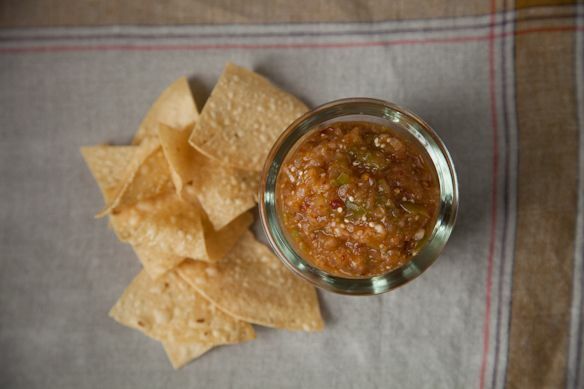 The salsa benefits from a little sitting time, so it's worth a little planning ahead. This looks delicious!. I often make a grilled tomatillo salsa from Rick Bayless, but never would have thought of adding in dried pineapple. I can't wait to try it. Sorry -- MrsW, that was supposed to be in in response to you! Merrill, it was fantastic. So unexpected and a great addition to the app platter of guacamole and traditional tomato salsa. I will admit to two slight tweaks. I couldn't find sweetened dried pineapple, only unsweetened, so added just a pinch of piloncilla, but I'm sure brown sugar would suffice. Also added the juice of one lime, just because I had an extra lime cut for the margaritas. I will make this over and over... Just loved it. Now I'm planning the lunchtime quesadilla w/ salsa and queso fresco. Love it!! I've got some tomatillos on my counter that I was just wondering last night how I would use. Now I know!! Perfect timing for this really interesting recipe. I would never have thought to use dried pineapple in a salsa! I know -- me neither! Love this. And I just happen to have 10 tomatillos in the veg drawer. And friends coming over for chili tonight with no appetizer planned. Serendipity and Food52 to the rescue! Thanks, Merrill.